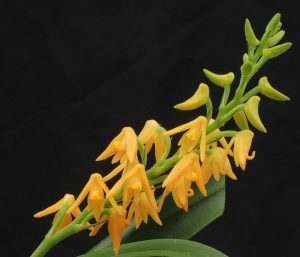 We have had the pleasure of coming across several Polystachya species during our expeditions to Rwanda and South Africa. 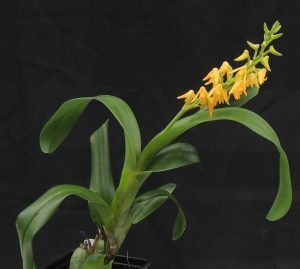 Polystachya bella clearly shows the characteristic non-resupinate (upside down) flowers of the genus and produces long sprays of hairy golden flowers from the top of the most recent pseudobulb. The species is native to the Kenya and Uganda where it grows in montane rainforest from 1800-1950m that will have a similar climate to the lower forests of Nyungwe that we have explored in nearby Rwanda. There are two dry seasons, a short one in the winter and a longer one in the summer but plants will receive some moisture throughout the year with even warm temperatures but cooler nights. We grow plants in our Warm Americas section (min 15C) in shade and find that plants grow quickly and the plant shown came out of flask three years ago.